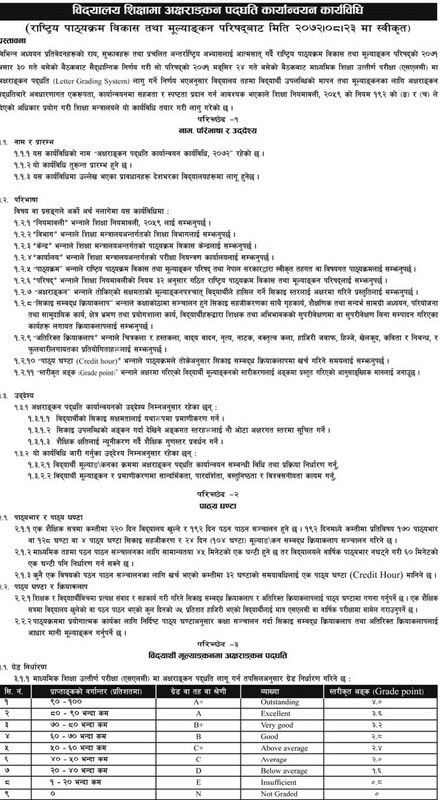 Government of Nepal, Ministry of Education, Examination controller division, Bhaktapur will be publishing the results of the School Leaving Certificate (SLC) examinations in letter grading system ending the practice of numerical grading. The meeting of National Curriculum Development and Evaluation Council held today (19th March 2016) has revised the letter grading system. Grading A+, A, B+, B, C+, C will remain same. The changes are in grade D, E and N.
Earlier provision of 'N' grade has been omitted in the revised system. A meeting of the National Curriculum Development and Evaluation Council headed by the Education Ministry took the decision to divide the SLC results in nine groups. The results of the students of giving SLC in the technical subjects last year were published in the same system. Curriculum Development Centre Executive Director Baburam Poudel said the SLC results will not mention pass or fail rather classify the results in categories namely 'A +' 'A' 'B +' 'B' 'C+' 'C' 'D' 'E' and 'N', with effect from the upcoming year.